If your company always charges the same gratuity, tax or fuel surcharge percentages, instead of adding them into each and every reservation, you can set these amounts to automatically show up in all reservations. First, go to the “Company” page. Just under the first section of information, you’ll see red text on the left side that says “Change”. Click this button to open your settings to edit mode. 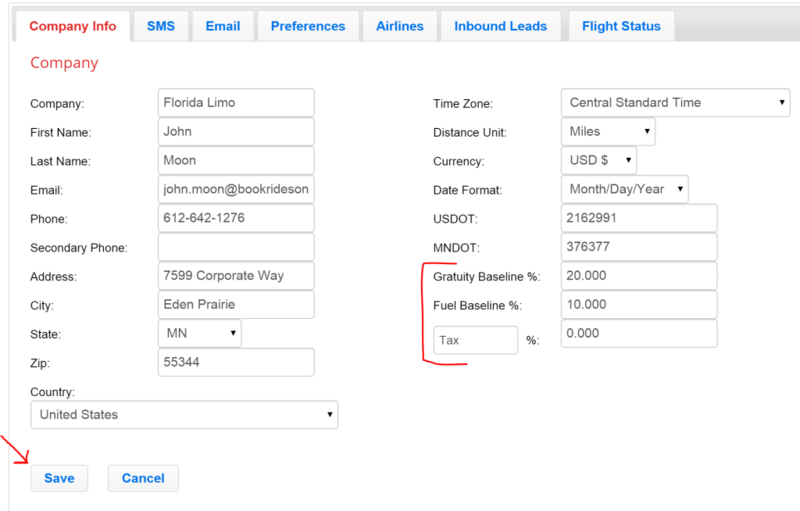 Once you’ve entered into edit mode, you can locate the settings for Gratuity Baseline %, Fuel Baseline % and Tax Baseline % here on the right side. Edit these amounts to the percentages needed. When you’re done editing your settings, don’t forget to click save.